iTunes is now available on some Samsung TVs. The first wave of AirPlay 2 enabled TVs are already here. 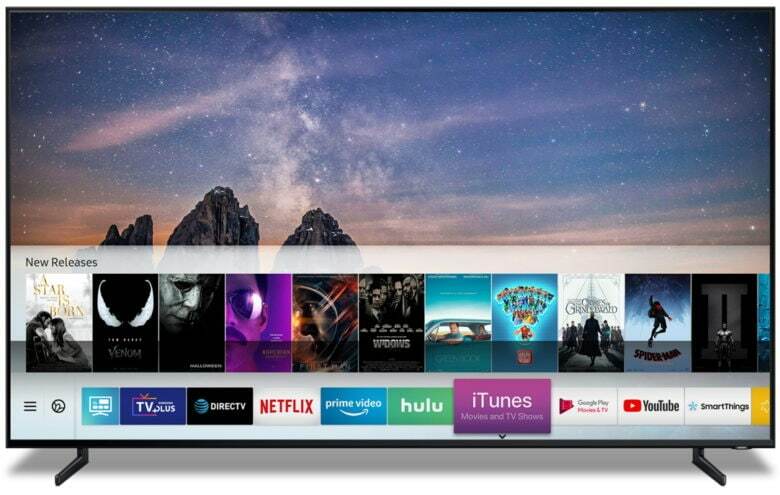 After revealing at CES 2019 that some of its new TVs would ship with an iTunes Store app and AirPlay 2 support, Samsung announced today that its QLED TVs are shipping out now. Sharing video from your iPhone to the big screen just got a whole lot easier. Samsung’s new iTunes Movies and TV Shows app allows you to access your iTunes library and shop for new TV shows and movies to rent or buy. The app works in conjunction with Samsung’s Smart TV Services too to provide a cohesive experience. By letting TV manufacturers add AirPlay 2.0 and iTunes support, Apple has opened up a way for iPhone, iPad and Mac users to play their content on TVs without having to buy an Apple TV. Apple is gearing up to launch its own video streaming service in 2019 and the AirPlay 2.0 support could be a crucial tool in gaining traction. Sony, LG and Vizio are also adding AirPlay 2 support to their TV sets. Those manufacturers aren’t including an iTunes app though. While Samsung’s QLED lineup will have the iTunes Store app installed out of the box, AirPlay 2 will come later in the year via a firmware update. The new TVs come in sizes ranging from 43-inch 4K screens to 98-inch 8K monsters. You purchase or pre-order the new TVs on Samsung’s website or pick one up at an authorized seller.